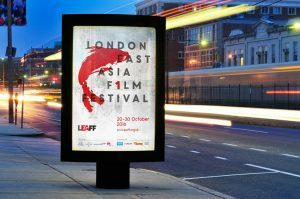 Sheffield agency Über has developed a brand identity and collateral for the London East Asia Film Festival. Taking place between October 20th and 30th, the festival aims to champion the growing collaboration and diversity in East Asian filmmaking. Über combined classic Asian influences with modern style cues to deliver what it says is a "unique and adaptable" design which was implemented across festival collateral including a major London poster campaign, invitations, leaflets and brochures. Über MD Richard Benjamin said: "Über has a long history in the visual arts from our long-term relationships with BAFTA and BFI to our work with 20th Century Fox, Universal and Warner Bros. Founded by Benjamin, Greg Clark and Pamela Broadberry in 2003, Über has also worked with the likes of Harveys Furniture, BAFTA, Casio, Budgens, BFI and Best Western.